The Subaru Legacy has been filling a need in the midsize car segment since the Japanese automaker first introduced it in 1989. Taking on competitors like the Toyota Camry, and Honda Accord, the Subaru Legacy stands out on its own with unique features, and a styling all its own. The Legacy is Subaru’s flagship car, with well over three million produced - and it is currently in its sixth generation. The 2015 Subaru Legacy has been completely redesigned for the 2015 model year. Exterior dimensions stay the same, but the interior of the Legacy is noticeably larger. With the new model year, comes a new list of standard features, including all-wheel drive, and a better fuel efficiency. Drivers are able to chose from four different trim levels, which range in both price and amenities. One of the most technologically advanced versions of the sedan, the 2015 Legacy now features Subaru’s advanced EyeSight technology, for an even safer driving experience. One of the most unique attributes of the 2015 Subaru Legacy, is the fact that it offers all-wheel drive as standard equipment. Drivers will feel confident conquering the road, regardless of the weather or conditions. Not many other midsize sedans can make the same claim - and the Subaru Legacy does so in an efficient way. Thanks to the newly designed exterior, and despite the larger interior cabin, the 2015 Legacy has made substantial gains in fuel efficiency. The all new 2015 Subaru Legacy gets an EPA-estimated 26 miles per gallon in the city, and 36 miles per gallon on the highway. What may be even more surprising, is that the Legacy achieves 175 horsepower with a 2.5-liter four-cylinder engine. Most other midsize sedans only offer all-wheel drive as a costly option, and fuel economy is no where near what the Legacy offers. The 2015 Ford Fusion SE equipped with AWD, comes in at $27,830 for its starting MSRP. The 2015 Legacy has a comparably equipped starting MSRP of only $21,695. Legacy drivers will continue their savings down the road, beating out the Fusion’s less than stellar fuel economy rating of 22 mpg city, and 31 mpg highway. The 2015 Legacy continues to stand out as the most affordable, and most efficient AWD option in the midsize sedan segment. Drivers who opt to purchase the all-new 2015 Subaru Legacy, will have the choice between four different trim levels: 2.5i, 2.5i Premium, 2.5i Limited, and 3.6R Limited. Each has its own unique price point, and standard features to match. Check out highlights of each trim level available for the redesigned 2015 Legacy below. 2.5i - Equipped with the standard 2.5-liter engine, this base model features 17-inch steel wheels, power side mirrors, halogen headlights, and a black finish grille. The standard rear vision camera helps keep you safe from possible obstructions, otherwise left unseen. 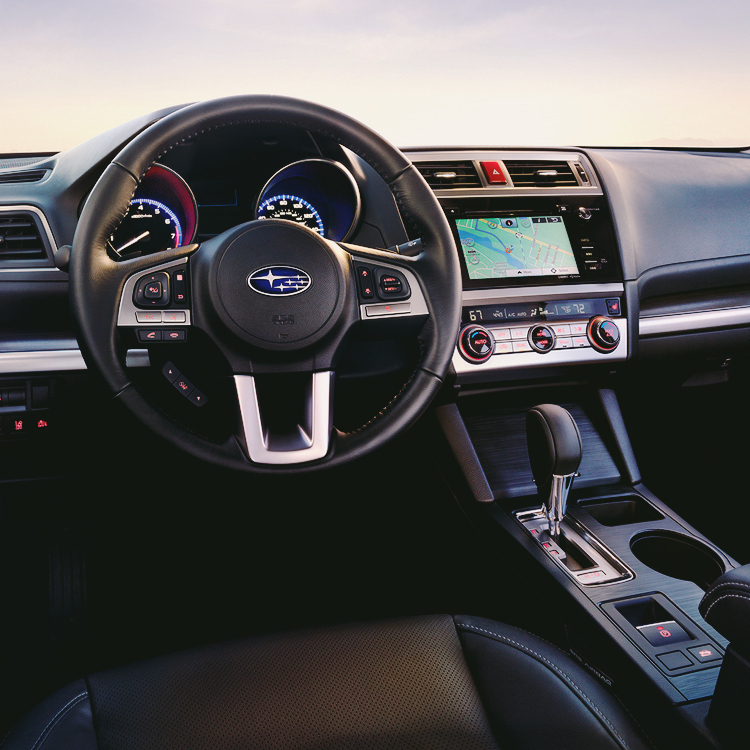 Inside the roomier cabin, the 2.5i boasts Subaru’s StarLink system with a 6.2-inch touchscreen, steering wheel mounted controls, silver accent trim, and a single USB port for connecting mobile devices. This trim level starts at just $21,695. 2.5i Premium - With a starting MSRP of $23,495, the next level up on the Legacy models, includes everything that the base model does, as well as a longer list of extras. The exterior includes 17-inch aluminum alloy wheels, heated side mirrors, a silver finish grille, and a windshield wiper de-icer. The interior cabin is equipped with a larger 7-inch touchscreen to complement the StarLink system, along with a 6-speaker audio system. Drivers will appreciate the 10-way power driver’s seat with power lumbar support, and heated front seats. Interior appointments give this Legacy model a more luxurious feel, such as the leather wrapped steering wheel and shift knob, and an instrument cluster with a color LCD display. Dual USB ports and dual-zone automatic climate control system, add even more comfort and convenience to the 2.5i Premium sedan. 2.5i Limited - This trim level will cost drivers $26,495, and boasts an impressive array of features. The 2.5i Limited includes everything that the 2.5i Premium does, and then some. Adding to the exterior refinement, is larger 18-inch aluminum alloy wheels, and power side mirrors with integrated turn signals. Drivers can stay safer on the road thanks to the standard Blind Spot Detection with Lane Change Assist, Rear Cross Traffic Alert, and fog lights. Inside, passengers will be wrapped in the comfort of heated leather-trimmed seats in both the front and second row, as well as woodgrain accented trim throughout the cabin. The front passenger will appreciate the 4-way power adjustable seat, and the entire cabin will enjoy sound from the 12 speaker Harman and Kardon GreenEdge system. 3.6R Limited - The highest-end Legacy model starts at just $29,595, and offers great value all for under $30,000. Featuring a larger 3.6-liter 6-cylinder engine, this model boasts 256 horsepower, high-intensity discharge headlights, and dual tail pipes with stainless steel tips. The interior of the 3.6R Limited remains the same as the 2.5i Limited, with the main difference between the trim levels lying underneath the hood. Subaru designed EyeSight, an advanced new technology to help monitor your safety while operating your Subaru Legacy. The EyeSight technology keeps an eye out, when your eyes may wander, or be looking at something else. The Insurance Institute for Highway Safety gave the Subaru Legacy with available EyeSight technology the highest possible score for front crash protection. The system incorporates active safety features to help keep you and your passengers safe. Adaptive Cruise Control - Two cameras mounted to the Legacy’s rearview mirrors help monitor traffic, and can react to conditions before you are able to. Pre Collision Braking - EyeSight can monitor vehicles in front of yours, and sound an alert of a possible collision. If you don’t apply the brakes in time, EyeSight will do that for you. Lane Sway and Departure Warning - EyeSight will warn you if your vehicle veers outside of your lane, without the use of a turn signal.